She does book reviews and author interviews. 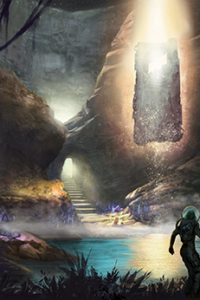 As a bonus for the author crowd, she is a pretty fair hand at graphics and does covers and blog design. I may even hire her at some point to do a site redesign for me. She hosts contests and challenges, which brings me to the point of this post. 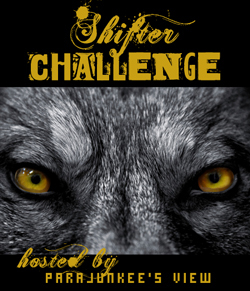 She has a challenge posted to read and review 20 shifter books this year. 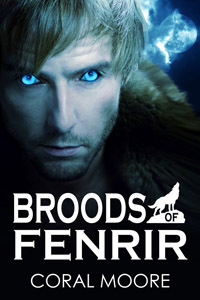 To qualify the book has to have a shifter as the main character. (She also has another challenge for vampire books, but I’m not doing that one.) Since I’m totally obsessed with were-stories these days, I thought I’d do my part and read/review as many indie werewolf books as I could get my hands on. Realized I never commented on this post. I checked out Parajunkee’s View. Interesting, I spent some time there also but she seems to be behind on her UF reviews. She seems to do E-books also which is good. I’m not going to do either of the two challenges you mentioned but I can see how they could be fun. But speaking of your shifter stories. I have come up with two idea about shifters, neither turn into wolves. After a trip to the book store yesterday, someone else may have come out with one close to one of mine. I can still do mine but I stil don’t know when. Shifters that turn into things other than wolves can be good too. I chose wolves this time because I wanted to use Norse myths as a backdrop of the story and there was already a preexisting story there with Fenrir. Shifter cats would be neat too, could tie those into Egyptian myths. Yeah, cats would be good. I read a fantasy series that had a couple with a child and all three could turn into cats. They were minor characters in only a couple of the books but still a neat idea. But wouldn’t an Egyptian shifter turn into a Jackal? Or that is they could. My idea would probably be YA book, I’m thinking. The MC would be a young man who starts getting certain pains and ends up with wings. Turns out he gets it from his mother but she was only a half blood and can’t turn. She never told him of his heritage thinking he wouldn’t have to know. But we shall see when ever I get to it. Hmmm, just dropped by to say this. Didn’t really need to but you write shifter stories and we have discussed it a bit. Anyway, trying t mkae this very quick. Tonight I was looking at a cover at deanwesleysmith.com and inspiration grabbed me. It looks like my muse wants to do a vamp- werewolf story. Dean shows the covers of short stories he is doing and the one dealing with “The Slow Boat Man” got my muse’s attention. It won’t be you’re average shifter etc. story, I want to put a twist in it. Hmm, I don’t do werewolf stories but I’m going to anyway.